The following statement was issued by Fishermen and Friends of the Sea on March 8th 2016. Fishermen and Friends of the Sea (FFOS) as well as all citizens of Trinidad & Tobago suffered a setback on Friday 4th March 2016, when Justice Nadia Kangaloo delivered her verbal judgement supporting the Environmental Management Authority’s December 2013 decision to award Petrotrin a Certificate of Environmental Clearance (CEC) to conduct seismic surveys without having to carry out an Environmental Impact Assessment (EIA). 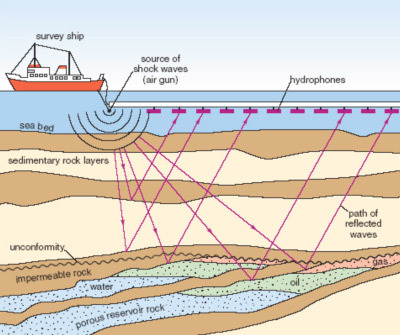 Seismic surveys comprise thousands of continuous underwater explosions, carried out every few seconds, over a period of several months. They penetrate deep below the seabed and throughout the ocean, and are used to determine the presence of oil/gas under the seabed. The small High Court room in Port-of-Spain was packed with over forty (40) anxious fisher folk. They had waited for over two years and came from around the country, to be present for the judgment. They left dejected but not defeated. A written judgement is expected by 14th March. FFOS sees this judgement as a major setback in the protection of our marine resources and livelihoods of fisher folk. The oil/gas sector has conducted scores of similar seismic surveys over the past decade. Fishermen have always claimed that after the surveys the fish disappear for many months and are slow to come back. Petrotrin issues compensation to boat owners for the duration of the survey and claim the fish return as soon as the surveys are over. There has been a major decline in fish stock nationally and worldwide attributable to multiple causes. Although the judgement came long after the surveys was completed, FFOS had wanted the EMA to require Petrotrin to carry out an environmental assessment which would have, at the very least, gathered data to see how much damage was actually being done by the survey. This was the purpose of filing for a Judicial Review of the EMA’s decision to award Petrotrin a CEC, without them having to assess the impacts of their activity. FFOS considers it a travesty that the EMA did not require EIAs for all the seismic activity which our marine resources have been subject to over the years. Had they done so it might have been possible to understand the cumulative impacts of these activities and distinguish them from others. Seismic surveys are known to kill fingerlings, fish eggs and damage and disorient fish in the vicinity of the area being surveyed. In delivering her judgement Justice Nadia Kangaloo declared she was “unconvinced” by the arguments made by FFOS’ legal team (led by Reginald Armour), that the EMA’s actions were illegal or irregular. Nor was she convinced that the impacts of the seismic surveys were serious and irreversible. The justice did, however, betray her feelings about the case referring to it, strangely, as a battle between “self-styled heroes”. Justice Nadia Kangaloo made no mention of the affidavit submitted in support of FFOS by Cathal Healy-Singh, an environmental engineer, who pointed out that the EMA had overlooked their own official internal Standard Operating Procedures in making their decision. They failed to file the answers to some seven pages of ‘check-list’ questions, designed as a decision making tool, to be signed and dated, to help the EMA determine whether or not the proposed activity should be subject to environmental assessment. There was no evidence on file that standard internal procedures were followed by the EMA. This, according to FFOS, should have helped convince Justice Nadia Kangaloo of procedural irregularity. Also speaking after the case, Bhadase Sooknan, in whose name the case was brought, declared “again, we the small people, we down, but we not out”. FFOS is planning a meeting of its members in March at Claxton Bay, to review in detail the judgement and what action should be taken next.